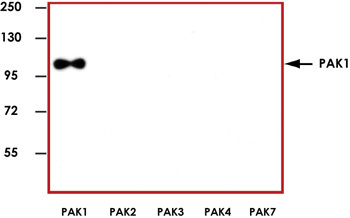 Sample Data :Representative western blot with Anti-PAK1 (1:1000) using 20 ng of human recombinant PAK1, PAK2, PAK3, PAK4, and PAK7. 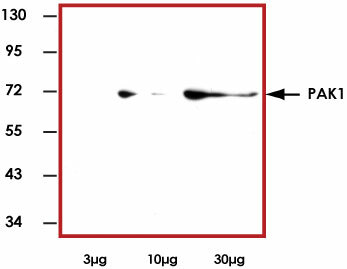 Sample Data :Representative western blot with Anti-PAK1 (1:1000) using 3 μg, 10 μg, and 30 μg of Jurkat cel lysate. Scientific Background :PAK1 is a member of the p21-activated kinases (PAKs) which have been implicated in the regulation of cell morphology, motility and transformation. These serine/threonine kinases are activated by and are effectors of small GTPases, CDC42 and RAC. PAK1 belongs to the Group I PAKs which also includes PAK2 and PAK3 (1). PAK1 is a key regulator of the actin cytoskeleton, adhesion and cell motility. Inactive dimeric PAK1 is mainly cytosolic and interaction with the activators Cdc42-GTP and Rac1-GTP stimulates the kinase at the sites of cellular protrusions forming adhesions to the extracellular matrix (2). 1. Jaffer, Z M. et al: p21-activated kinases: three more join the Pak. Int J Biochem Cell Biol. 2002 Jul;34(7):713-7. 2. Parrini, M C. et al: Spatiotemporal regulation of the Pak1 kinase. Biochem Soc Trans. 2005 Aug;33(Pt 4):646-8.